TBs poll for '2008, 3rd Quarter Favorite week TechVideos' have already finished some days ago, with 85 votes after being open for 10 days. Here it goes the results. 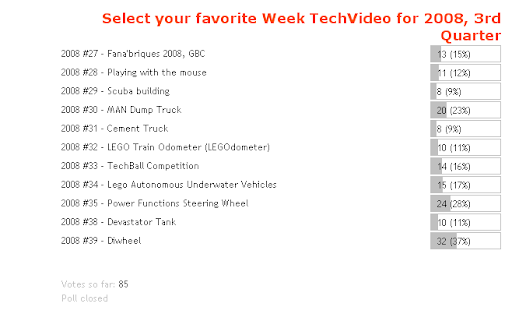 Poll objective was to let you choose your favorite videos, from those weekly presented here during 2008 3rd quarter, at section 'Week TechVideo'. No ex aequos for the first time. As in the last one, the winner of this poll is a video from Sariel. This time, the video for his magnificent Diwheel. It seems enough for Sariel to have a video on the list, to win the poll. Below as usual, the: 1st, 2nd and 3rd most voted videos. #1 - "Week TechVideo, 2008 #39 - Diwheel'"
#2 - "Week TechVideo, 2008 #35 - Power Functions Steering Wheel"
That's OK, continue to make the videos, that we like them!